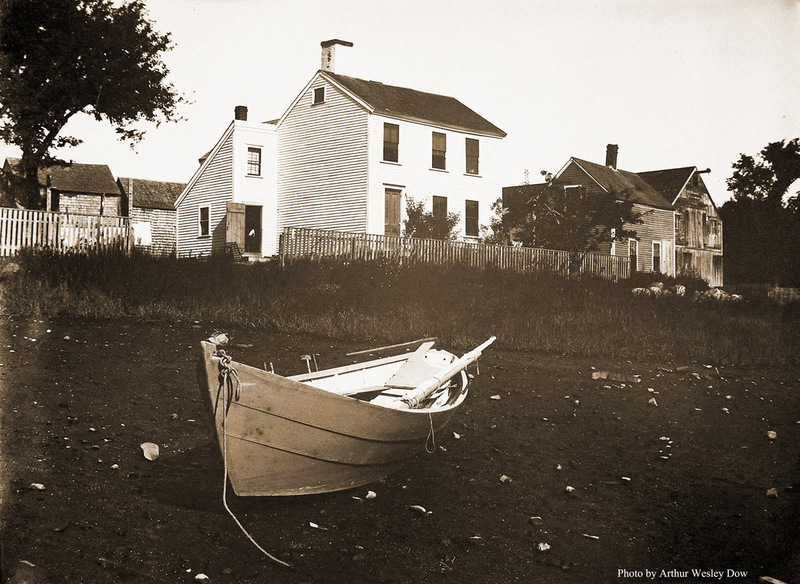 Photo by Arthur Wesley Dow of the boat shop on Water Street, taken from they Turkey Shore side of the river. 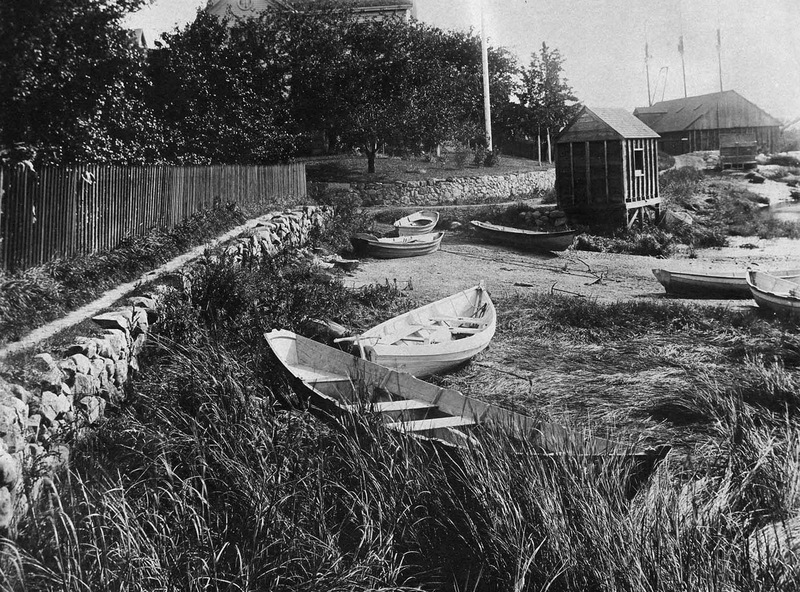 In the book, Ipswich in the Massachusetts Bay Colony, Volume I, Thomas Franklin Waters recorded the history of Water Street, which is part of an early public right-of-way that extended from the wharf to the Green Street Bridge, then cotinued along the Sidney Shurcliff Riverwalk to County St.
Clam shacks on Water St. Photo by George Dexter, circa 1890. 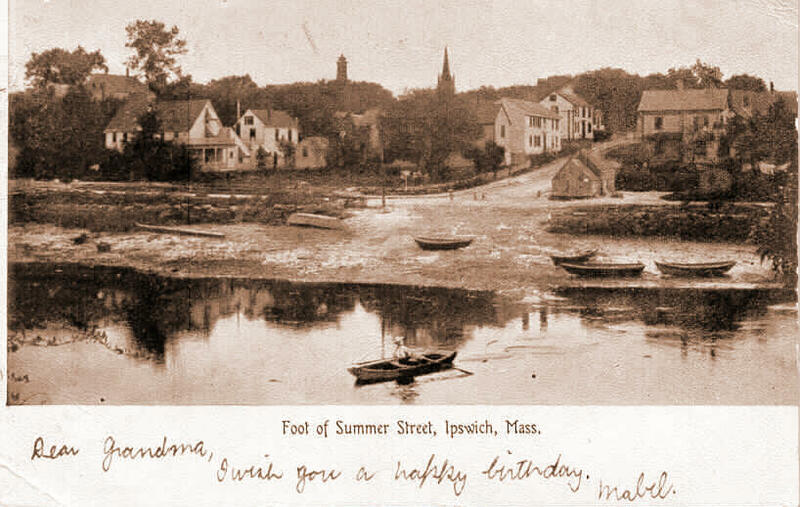 Notice that at that time, Water St. was just a wide dirt path. 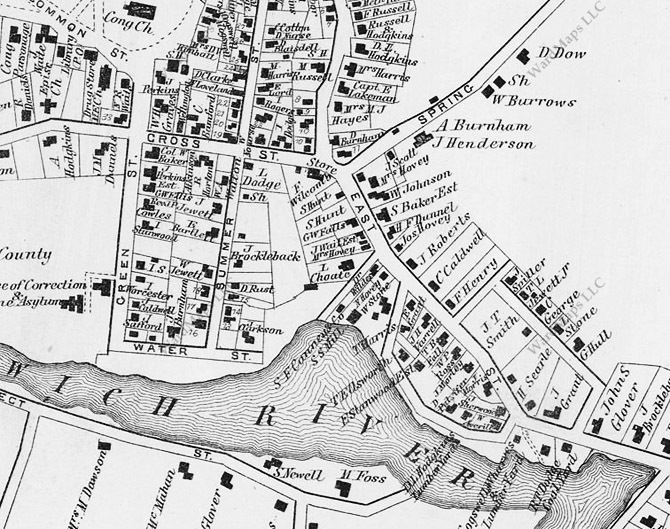 The 1872 Ipswich map shows a section of Water Street missing. 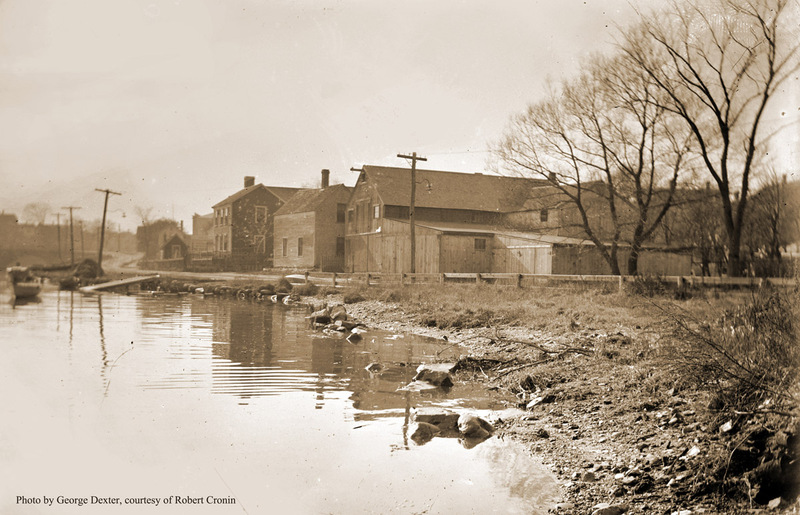 Between Summer Street and Hovey Street, Water St. was still an unimproved dirt pathway. 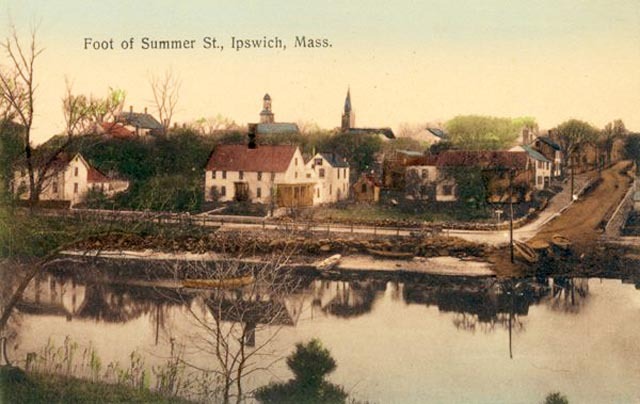 Water Street and Summer Street were the town’s first adopted “Ways,” and in the early years were known collectively as “The Way to the Meeting House,” and “The Way to the River.” The two streets host many of the town’s surviving First Period houses. 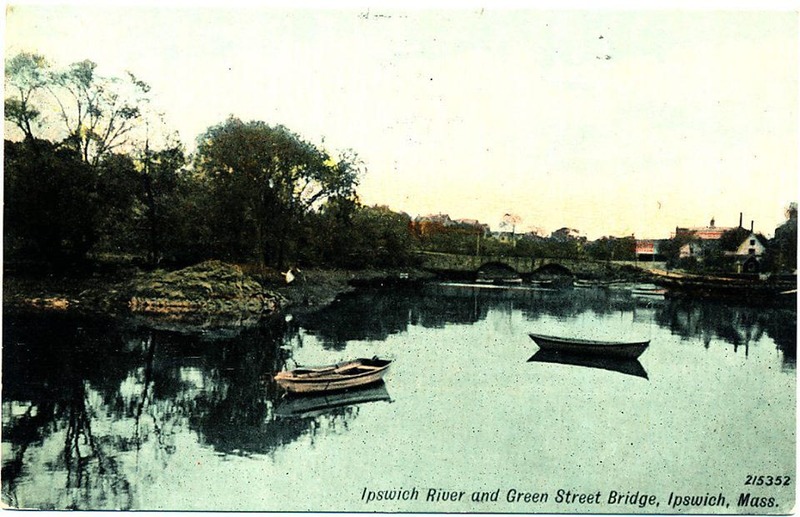 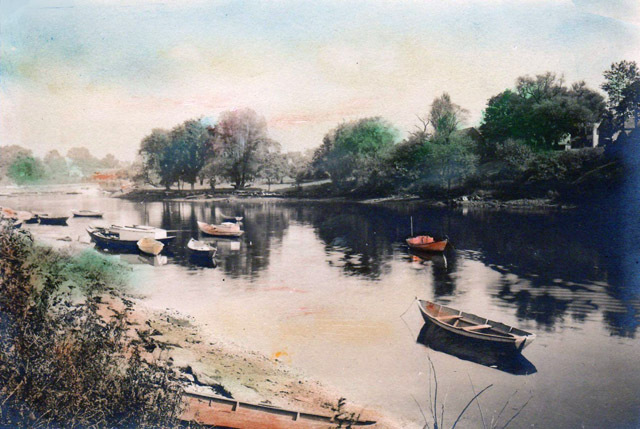 Shown below are historic photos and postcards of the Ipswich River and Water Street, which were the seafaring areas of the village of Ipswich, and are the heart of the East End Historic District, listed in the National Register of Historic Places. 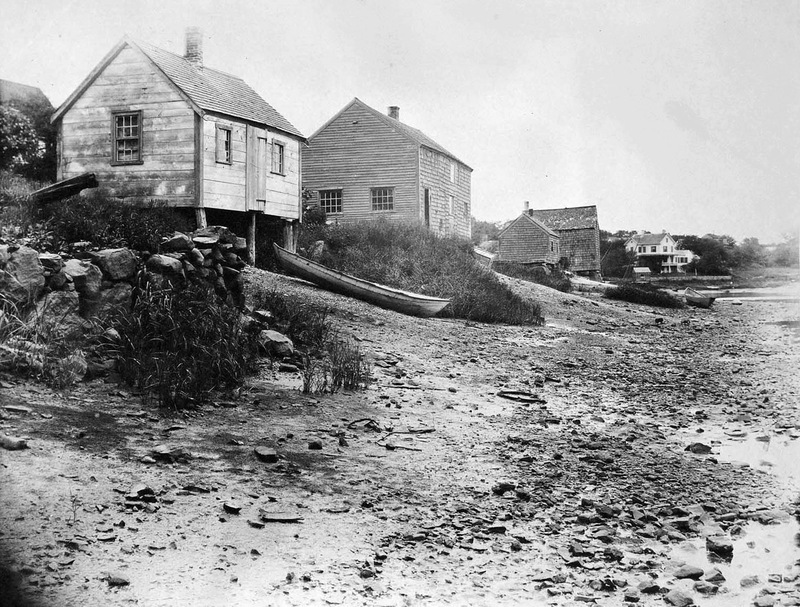 Water Street at the foot of Summer Street. 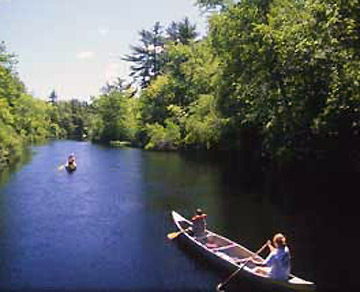 The Ipswich River looking upstream from the Green Street bridge. 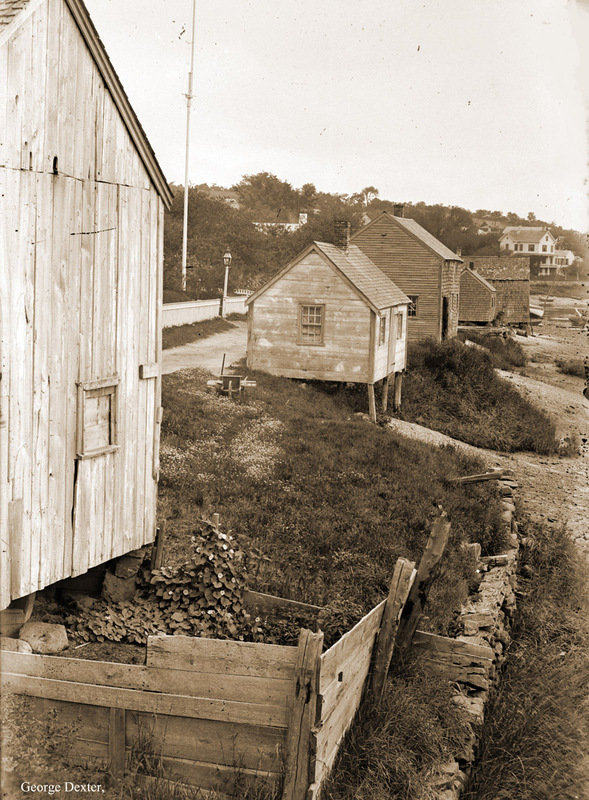 Water St. approaching the Town Wharf. The small building may have been the old Customs House. 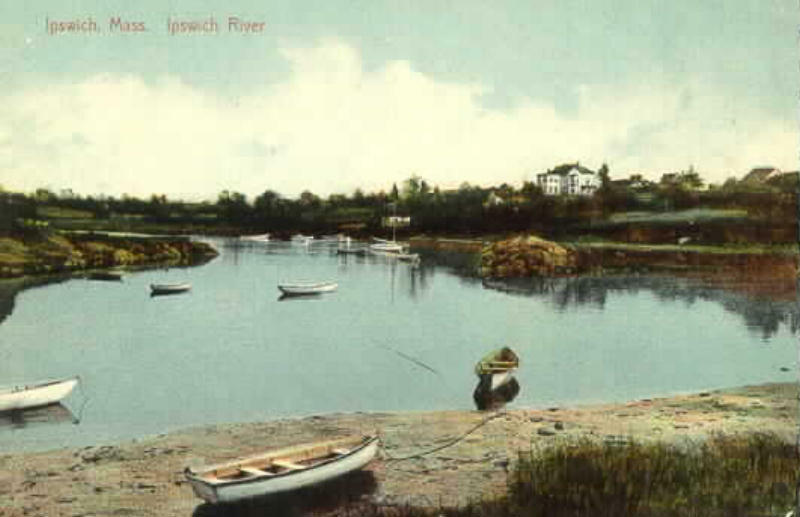 The Ipswich River, running alongside Water St. 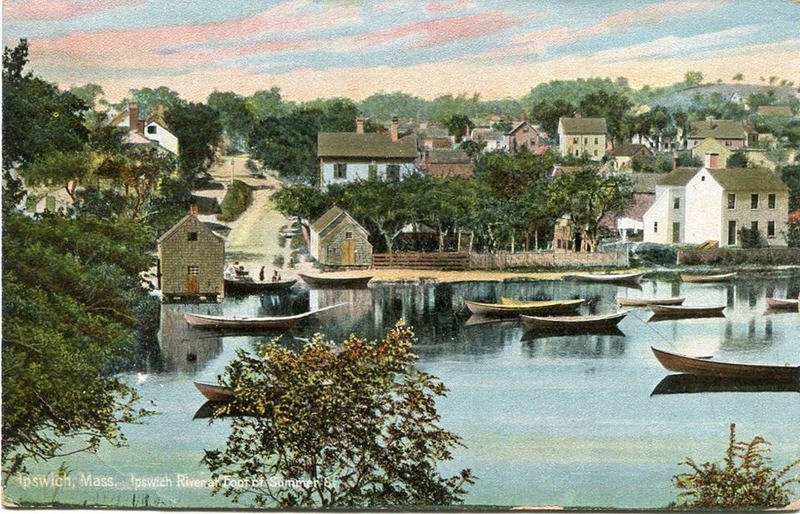 The pirate Harry Maine’s house on Water St. 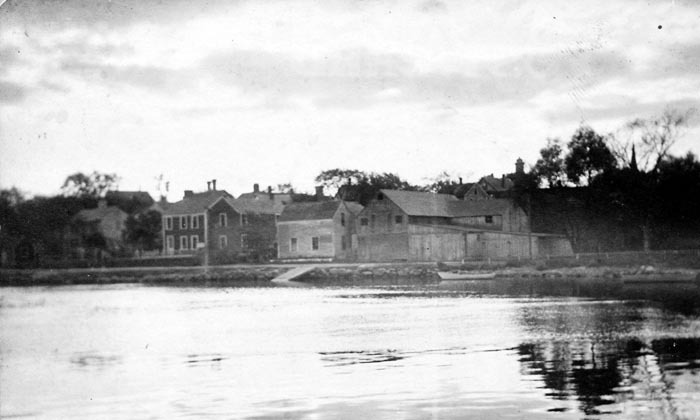 The B. Ellsworth house at the foot of Hovey St. Glover’s Coal Wharf is on the far right. 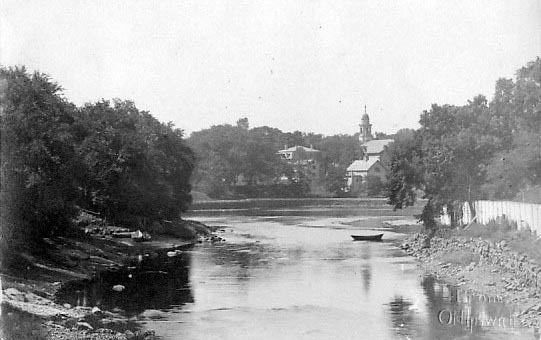 Water Street near the Green Street bridge. 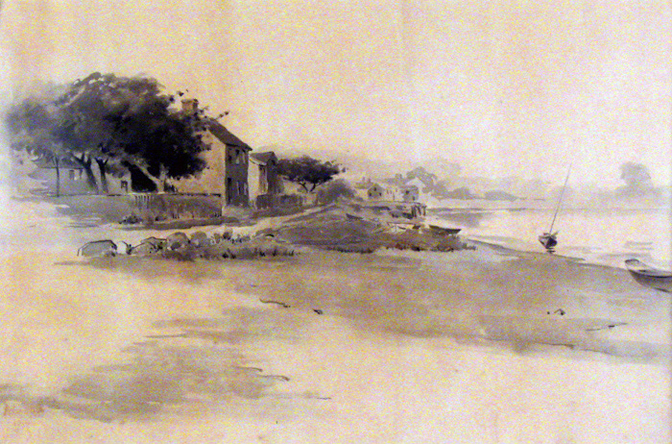 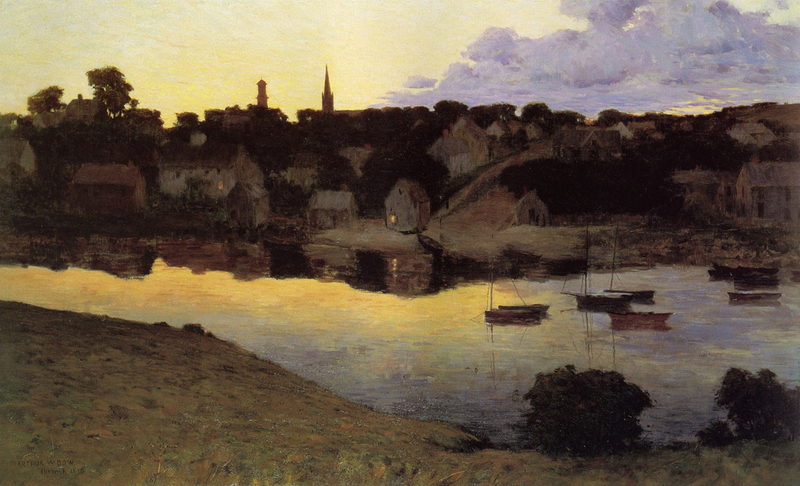 Watercolor by Arthur Wesley Dow, who lived across the river. 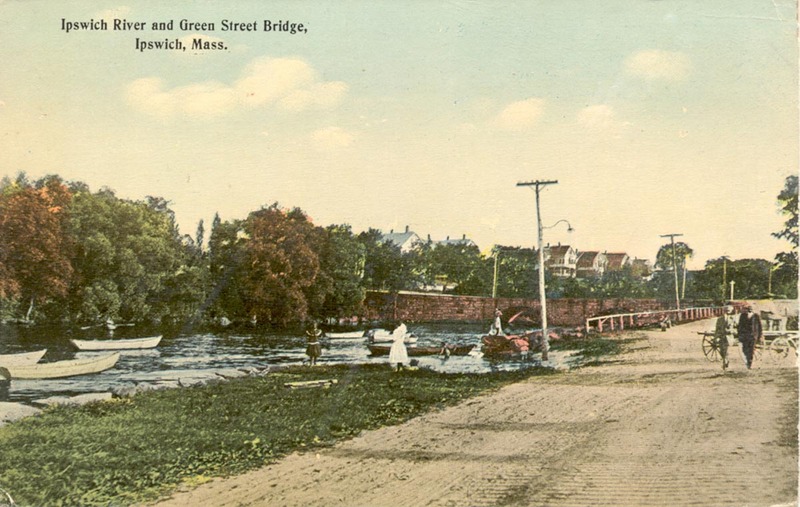 Looking toward the Green Street bridge. 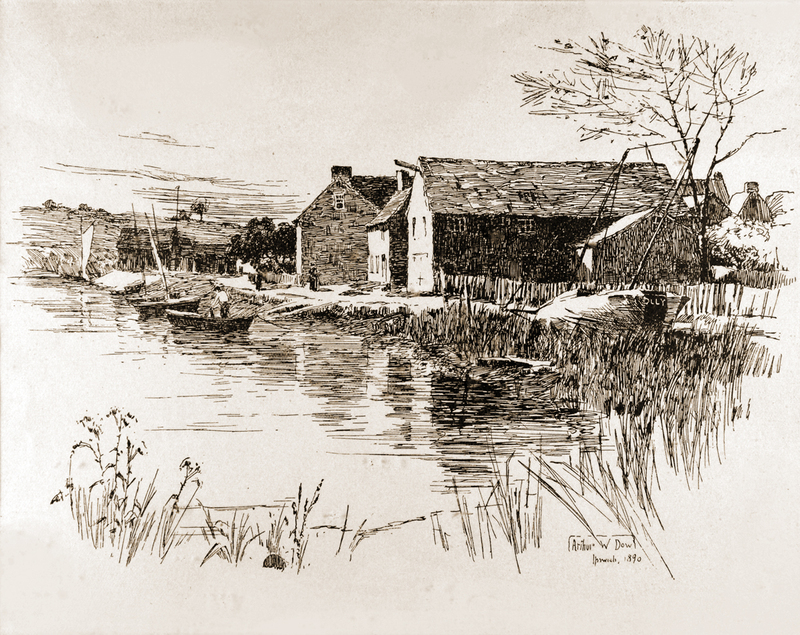 Low tide on Water St.
Block print by Arthur Wesley Dow of houses on Water Street. 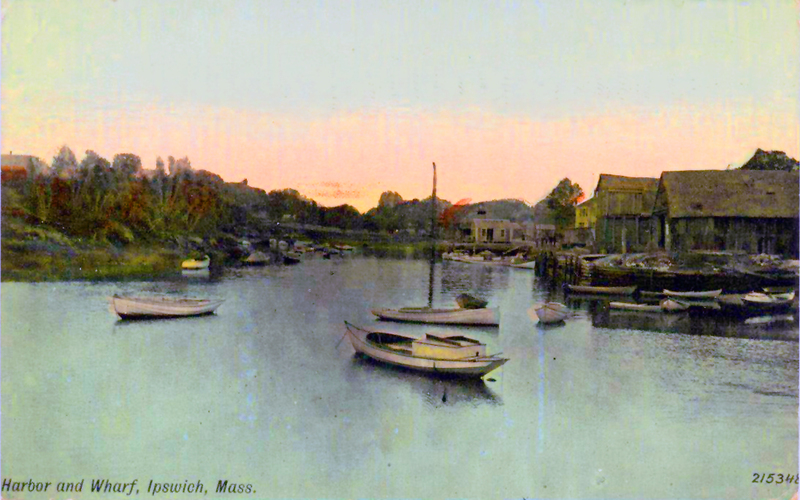 Postcard of the Town Wharf, with Water St. in the background on the right and the Green St. Bridge in the distance. 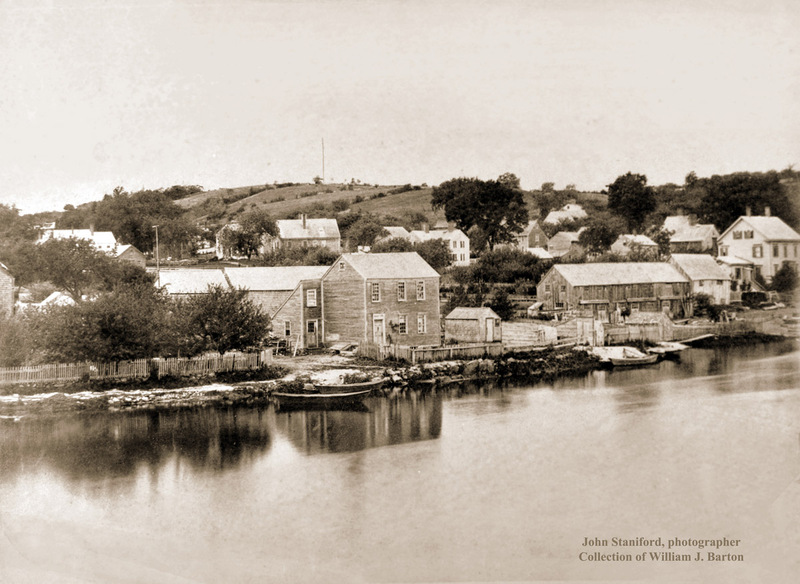 Water Street is on the left in this photograph of the Town Wharf in the 19th Century. 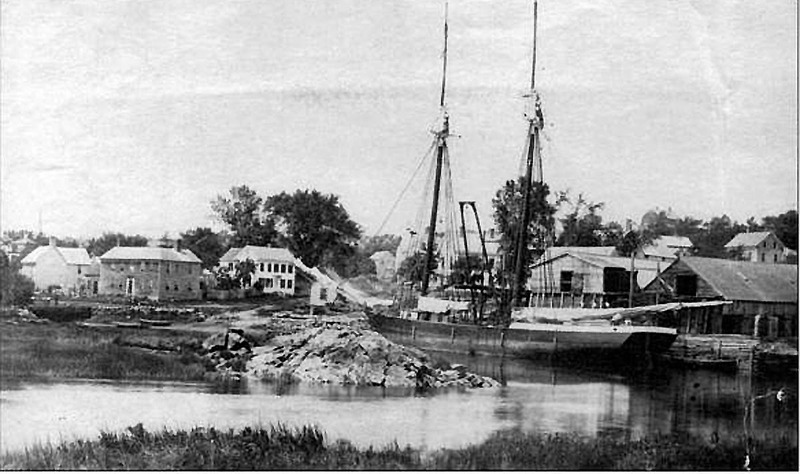 A coal schooner at Brown’s Wharf. 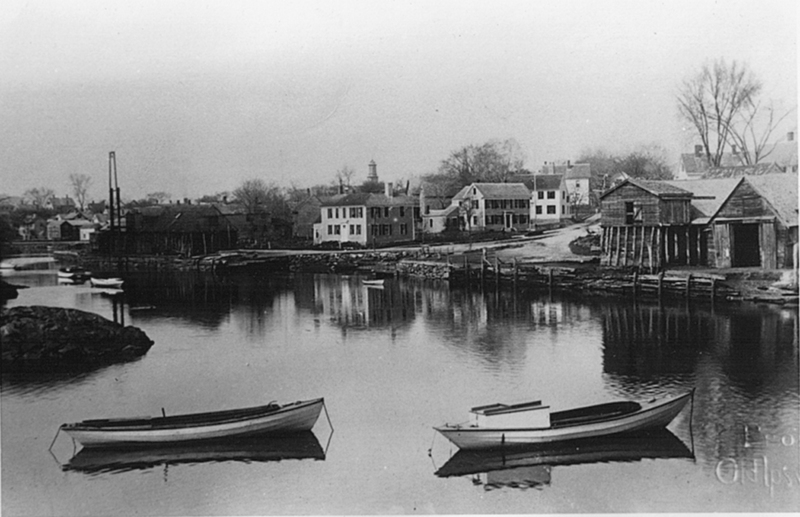 Glover’s Wharf was on Water St. near the Town Wharf. 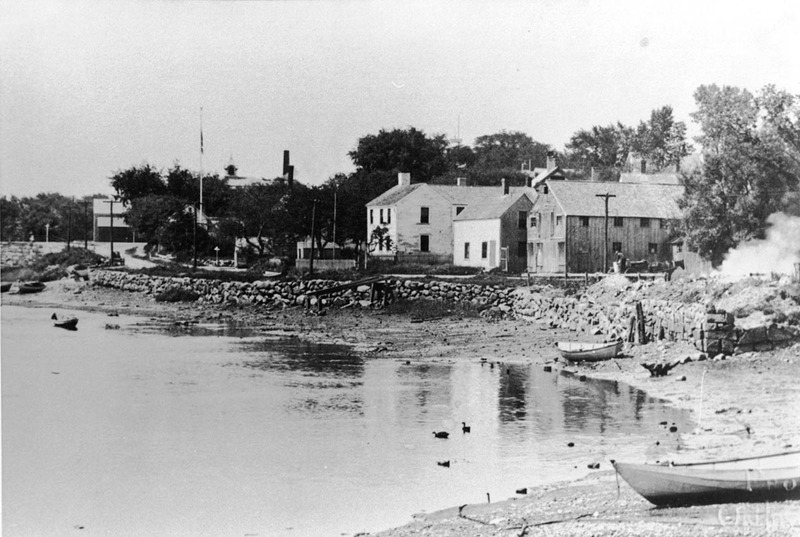 The wharf area at the far end of Water St. in 1910. 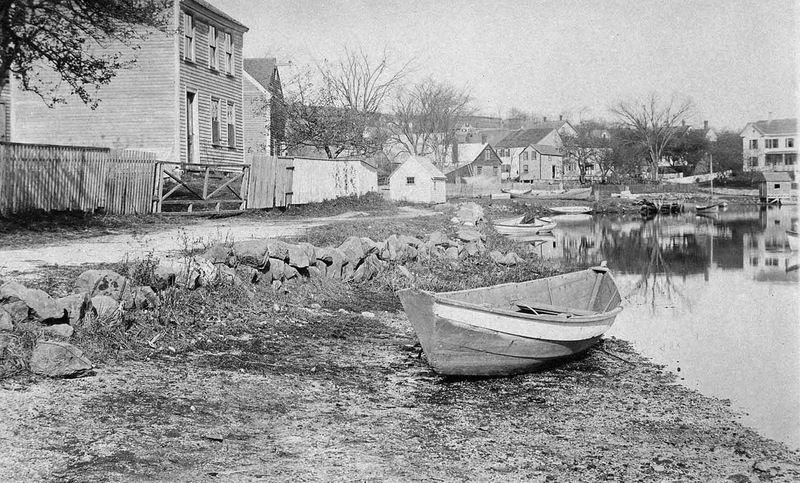 Water Street 1909, view from the current Ipswich Yacht Club site. 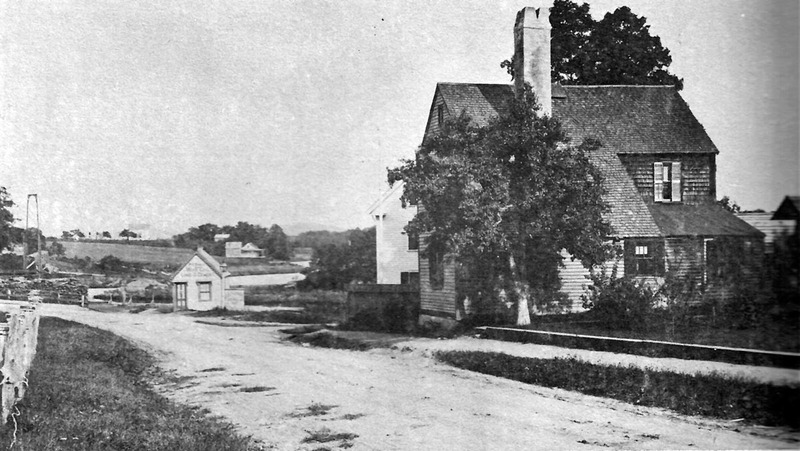 In the background is Fall’s Coal Barn, which burned in the 1920’s.. Mr. fall delivered coal door to door with a horse-drawn wagon. Another view of Summer St. from Turkey Shore by George Dexter. 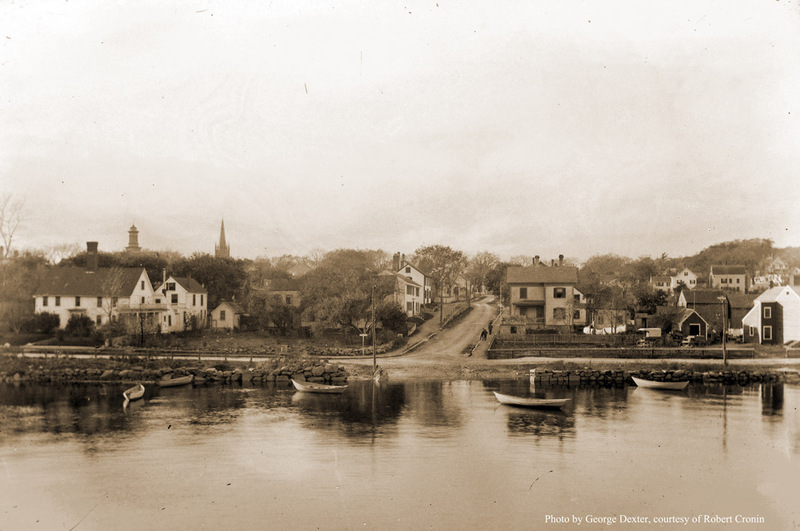 This photo was shared with us by Bill Barton, from the collection of his grandfather, William J. Barton. 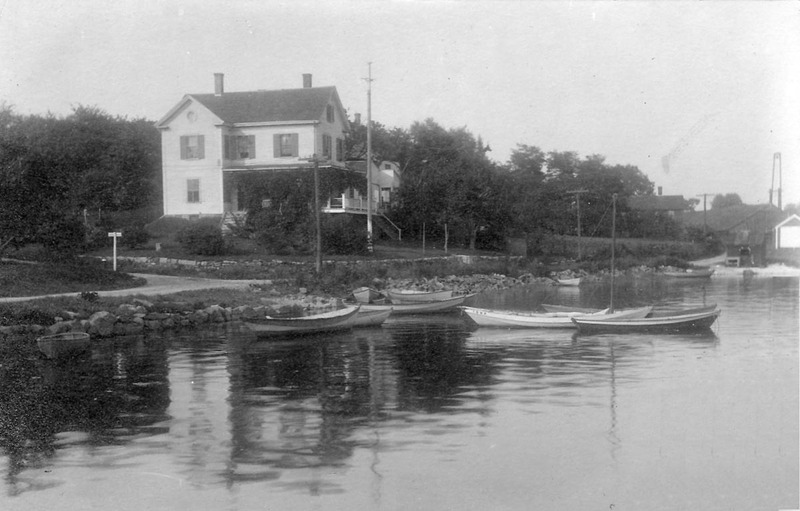 Herman Melanson’s Boatyard on Water Street burned in a spectacular fire on August 7, 2009.The boathouse was constructed by Herman Melanson’s father in 1954 and was also his residence. 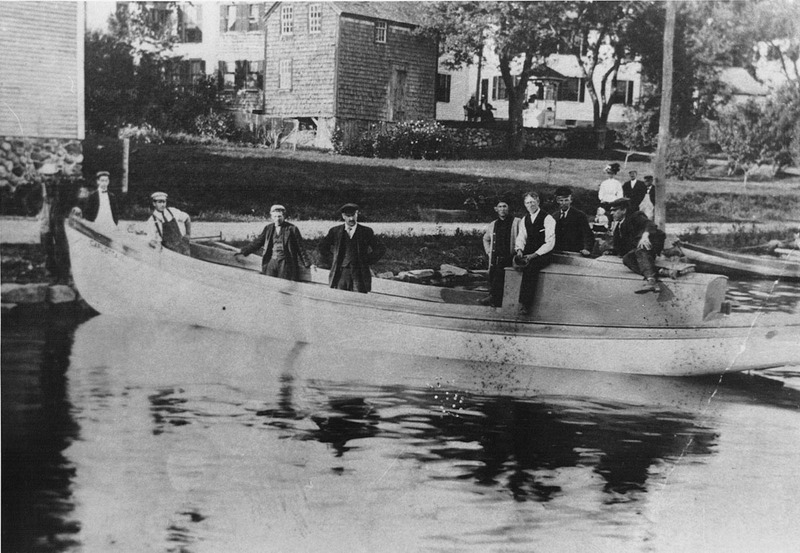 The entire building, three boats and several vehicles were destroyed. 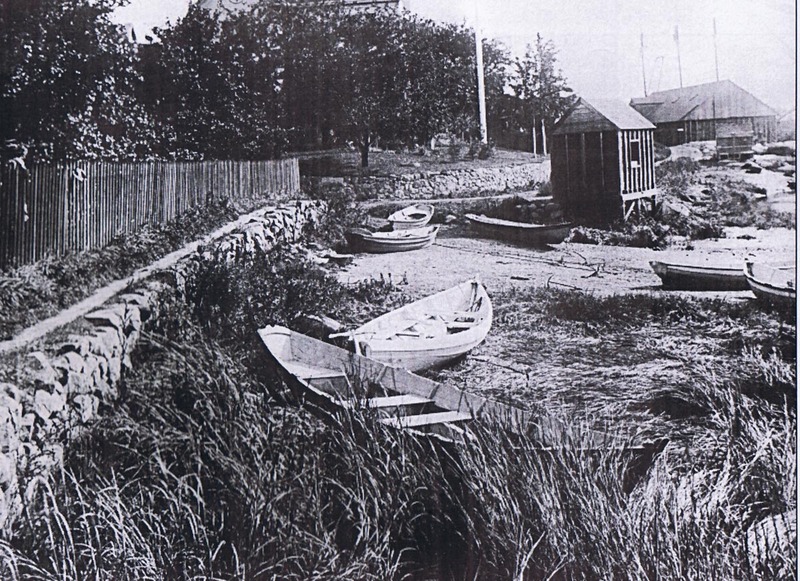 In previous years, Melanson’s boathouse had been an active boat-building facility. 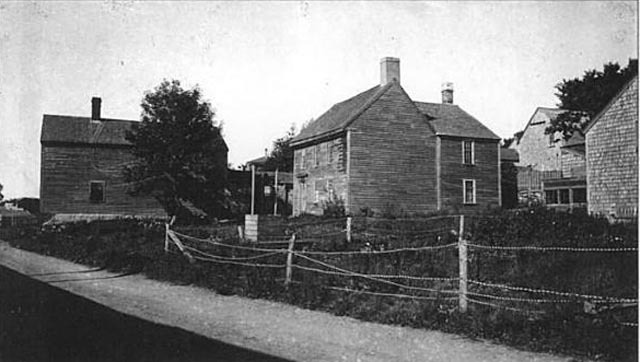 Mr. Melanson and his health-care worker managed to escape. This video was posted on Youtube by Donald Freyleue.